If your someone who appreciates a good steak then this is the place for you. Overlooking Hilary's Boat Harbour there is seating inside, upstairs and outside. This place is always busy so booking in advance is ideal. The menu is detailed when describing the steak cuts and they claim that all steaks are Meat Standards Australia grade and aged for a minimum of 21 days and come flame grilled on a wood-fire grill with your choice of sauce and fries, mash or a baked potato (dinner only) with sour cream and small salad. For the mains I have tried the Lion Kill. 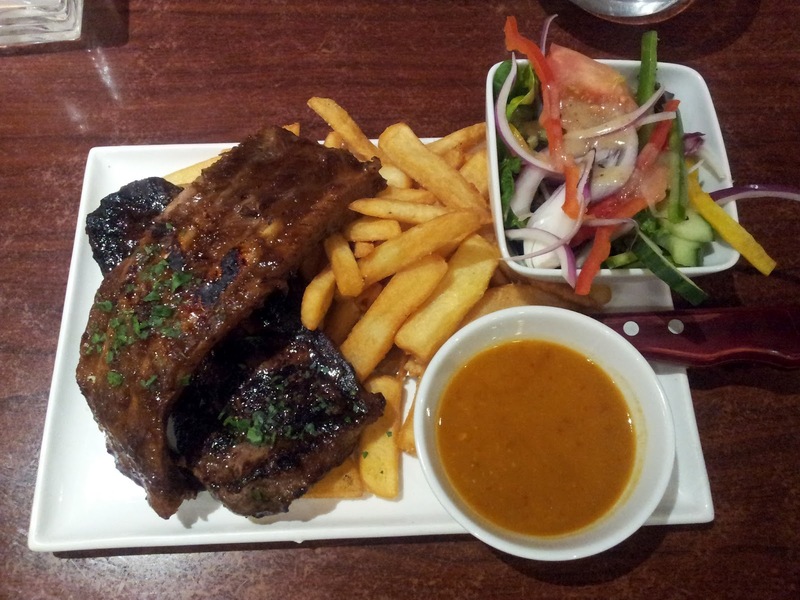 This meal is fantastic value for money if you are a big eater. The steak is cooked according to your preference and tasty on its own. I find that the sauces are quite salty and so far have only enjoyed the mushroom sauce and did not enjoy garlic butter or peri-peri as they override the natural flavours of the steak. 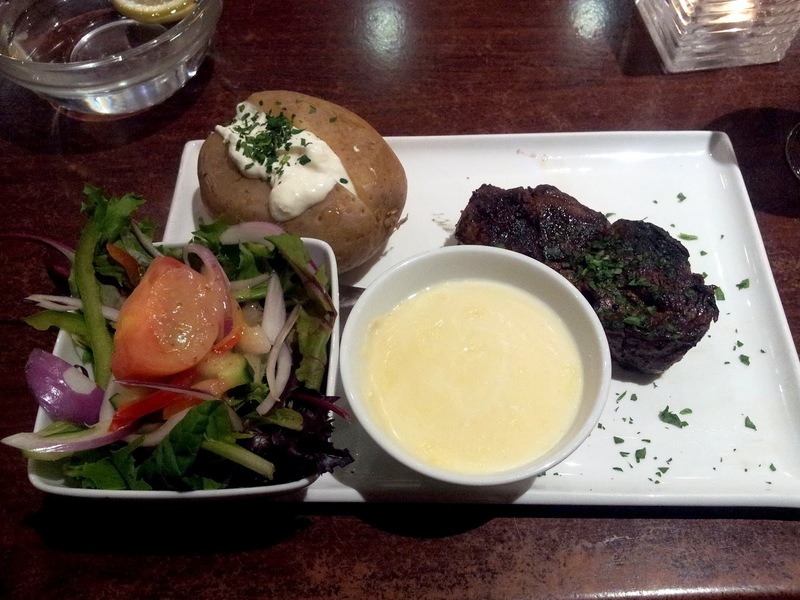 The steak was slightly burnt on the outside when we had asked for medium well but the flavours were good. When I had asked for it to be cooked medium the previous time I came here, I thought it was cooked much better. The pork spare ribs were seasoned well and are bursting with flavour. The quality of the meat is high and there is only one way to eat them: with your hands. On the side of the dish I prefer the baked potato which comes with sour cream and chives which is a decent size. The chips are quite dry and salty, lacking a crisp texture. The Black Angus 250g Fillet - This was thickly cut and was tender. The seasoning was well balanced. I asked for it to be cooked medium well and it came slightly burnt on the outside similar to the sirloin I could tell that the quality of the meat was much better than the 300g sirloin, but I thought the sirloin had more flavour even though it was less tender. Naturally, the sirloin also contained more fat. 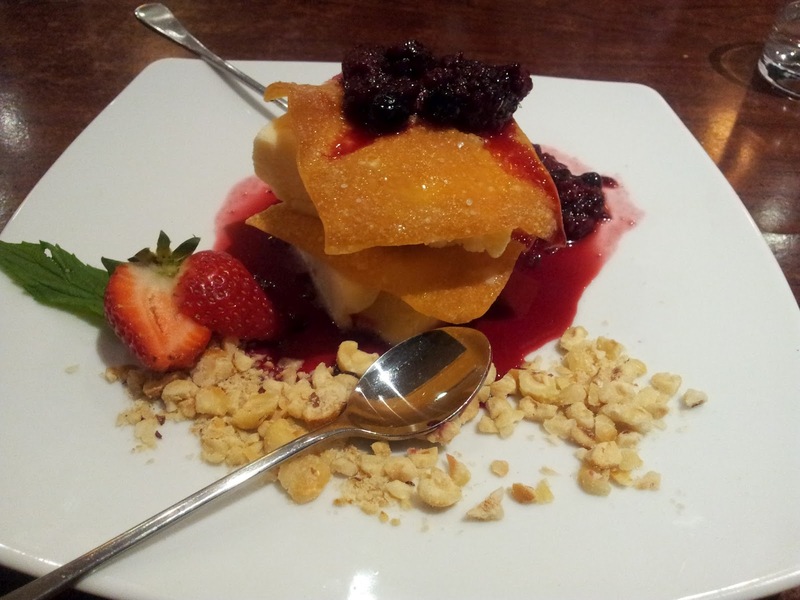 Home-made white chocolate and vanilla ice-cream with sugared wonton pastry, crumbed cashews, raspberries, blueberries, strawberries in a berry sauce. For dessert we tried the home-made white chocolate and vanilla ice-cream with sugared wonton pastry and berries. It looked appealing however, I didn't like this very much. The sugared wonton pastry was very hard and was not crispy. The home-made ice-cream was a bit ordinary for my liking and I could not taste the white chocolate flavours. The berry sauce was sickly sweet. Over the years I have seen a bit of a menu change with more emphasis placed on the steaks moving away from pork and game meat. The quality of the steaks is fairly consistent. BLUE - Sealed on the outside while steak is at room temperature. RARE - Cooked for approximately two minutes on each side, still very bloody. MEDIUM RARE - Maintains a blood red strip in the centre with grey edges. MEDIUM - Predominantly grey with a pink centre. Slight Blood reminisce. MEDIUM WELL - Grey from edge to edge with slight pink centre. WELL DONE - Very firm with little juice, grey throughout.